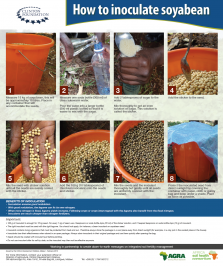 A3 landscape poster on inoculating legumes stressing the importance of using the right inoculant for the right legume. It is good to inoculate is a 6 paged-A3 landscape flip-chart. Produced at an ASHC write-shop in Uganda.